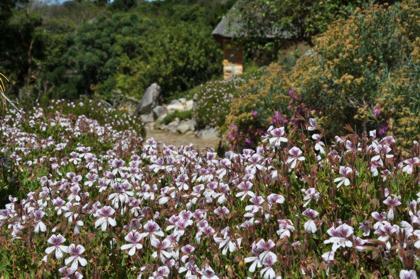 The Koppie is a well drained rocky outcrop displaying mainly Pelargonium species and close relatives from the Geranium family. Pelargoniums are well known for their beautiful brightly coloured flowers, fragrant foliage and ease in cultivation. Visitors will see the plants that are the parents of today’s garden hybrids, e.g. Pelargonium peltatum the ivy-leaved pelargonium, as well as many more species that are not yet well known to gardeners. Pelargoniums are at their best in late spring to summer (September-November). The Koppie also contains a diversity of other species, including fynbos plants, bulbs and drought-tolerant plants. If you know these plants as geraniums, you may ask why we call them pelargoniums? And if you know them as pelargoniums, you may ask why some people insist on calling them geraniums? Pelargonium is their botanical name. They belong in the genus Pelargonium, which belongs in the Geranium Family (Geraniaceae) along with the ‘true’ geraniums of the genus Geranium. The confusion can be traced back to 1753 when Carl Linnaeus classified both geraniums and pelargoniums in the same genus: Geranium. Back then they were both commonly called geraniums. But, in 1799 another botanist named Charles L’Héritier split them into the two genera we know today. However, many gardeners did not get the update and never forgot the older name and it is still in common use. The sun shelter on the Koppie provides rest and shade on hot days, and commands an excellent view over the Garden and across the Cape Flats to the Hottentots Holland Mountains. 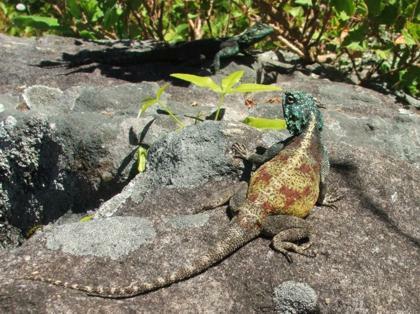 This area of the Garden is also a good place to see lizards at Kirstenbosch, they are often seen sunning themselves on the rocks. The Koppie was laid out very early in the development of the Garden. At first aloes were planted on it, and it was known as the Aloe Koppie, but most of the aloes failed to thrive here and were moved to Mathews’ Rockery. The only aloes to be found here now are Aloe plicatilis (fynbos aloe) and Aloe arborescens (krantz aloe).